What Your Restaurant Website Needs | Infomedia, Inc.
From food-ordering apps to digital table reservations, the culinary industry has been changed by technology and it will benefit restaurants (and their websites) to keep up-to-date on the latest innovations. In an age where there’s an app for everything, it’s a good idea for restaurants to have websites that reflect knowledge about the latest tech and an understanding of what customers want. Infomedia has created multiple food-focused websites throughout our over 20 years of business, and during that time we’ve learned a few things about what restaurants need to include on their sites. Keep reading to learn our team’s top five must-haves. Since you’re a restaurant, then it’s obvious that anyone visiting your site is in search of something to eat. Because of this, keep your food the focus by making the menu(s) easily available in the main navigation. If you have a singular menu, then it’s a good idea for your menu page to openly display it. If your business has multiple menus (varying per location or per time like lunch and dinner), then it might be a better idea to make a page that links to the various menus in PDF format. If your establishment offers online ordering, catering or delivery, then it helps to have a dedicated ordering page. Not only will it keep your restaurant’s phone from ringing off the hook with to-go orders, it will also make it clear to customers that you offer takeout options or catering sizes. If you’re not interested in having an in-house order form, or you don’t offer delivery, then it might be a good idea to team up with a delivery app. Some good options include Waitr, Doordash and Grubhub. 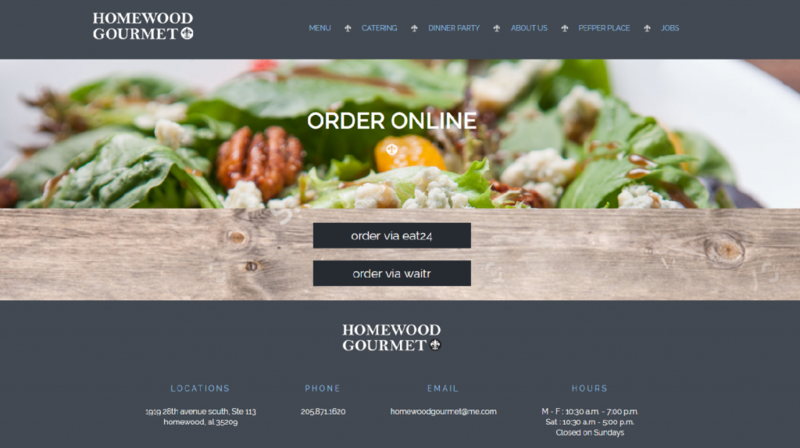 We like the way Infomedia client Homewood Gourmet gives customers multiple options when ordering. Having a “Contact Us” section is a basic need for any website, but it gets more specialized when a restaurant is involved. People will often reach out to ask about menu items to see if they’re suitable for those living with a food allergy/sensitivity or restriction (vegan, kosher, etc. ), so it’s important to make it easy for customers to get in touch with your staff. If your restaurant is highbrow or popular enough that reservations are required, then adding a “Make Reservations” button or page to your website can really help. It will prevent customers from calling to ask about hours and party sizes; it will make it easy for hosts to see if there’s a large party coming at a certain time, and it’s likely to encourage customers to reserve their seats instead of just showing up. You can use OpenTable as a third-party app or use a website design company (like Infomedia) to build you a custom functioning reservation application. If you have a chain or franchise of restaurants, it’s a best practice to have a page dedicated to “Locations” alone. For SEO purposes, we recommend having an interactive Google map pin-pointing locations. Then you can add necessary details for each branch, including information like open hours, phone numbers and addresses. 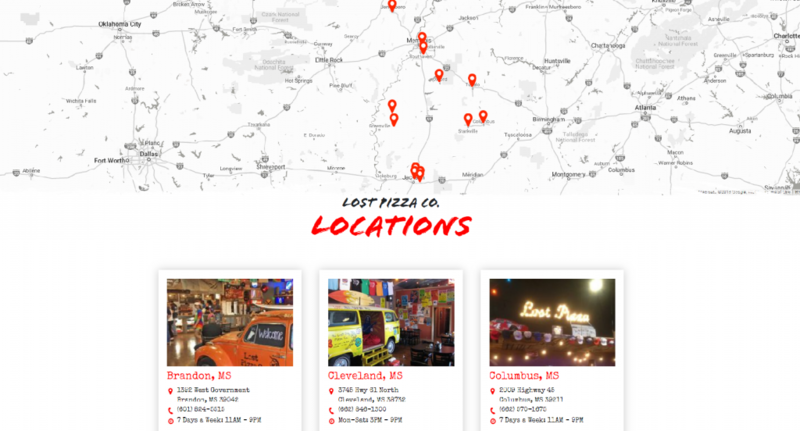 Infomedia client Lost Pizza Co. makes finding their locations simple by providing a map view and listing the basic information of each restaurant. Every business should link to their social media channels, and restaurants are no exception. Posting a picture of a juicy burger on Instagram or sharing descriptions of your daily specials on Facebook may draw in more hungry customers than you realize. If you’re a restaurant or food-based business looking for a new website, Infomedia would love to work with you. Just reach out to us to start a no-commitment conversation about your website needs and see what services we have to offer.